We definitely need a name for this group. 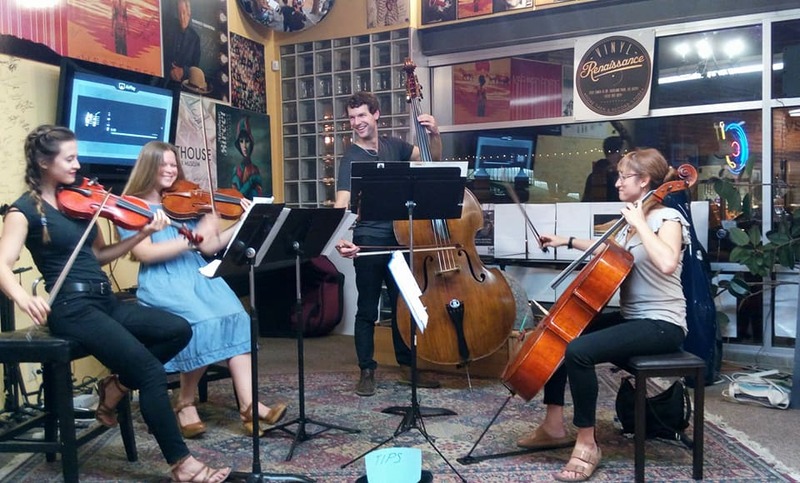 Right now, we’re under the long-winded moniker of Classical Revolution Kansas City String Quartet. If you could suggest a cool name, or have a dollar, drop it in the tip jar; we hope you like what you hear! 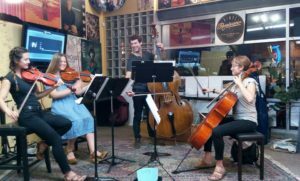 At Vinyl Renaissance: string players covering jazz charts, playing onstage as background music at a wine-tasting in a record store. You thought Austin was weird? This is Kansas City– this is rock ‘n’ roll. This is the lifestyle no one talks about in music school. It’s a great gig though, I love it. The folks at Vinyl Ren’ love music, and I’m glad they have us out to play in their unique spot. We’ll be back again Thursday for a longer, private event. Right now, we’re hustling for music to play! Scanning parts, copying scores, downloading arrangements– sometimes it feels like an office job, the amount of screen-time and pushing paper to get the folders together for the gig. Wait, which tunes are we playing again? What order are we doing? How many repeats on this one?